Only for ATS or Ets2 can you expect ? And if someone is not a VIP client and has not received any updates yet, who can they apply to ? Although it has been forgotten and I am asking that nobody drives it, I would like to ask if there will be anything to do about this truck (picture) for patch 1.32.x, because it looks a little sad in the store ? I do not know if this is a good place to report bugs and suggestions if I do not Apologize. I noticed a slightly shifted texture. 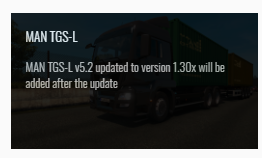 If you mentioned above about MAN TGS-L then I would like to ask if there will be a possibility of a torsional drawbar in one of the trailers for this Man, because it is in version 1.30 but there is no skittish drawbar ?